The humble denim has come a long way since its inception days. From a blue-collar staple to a fashion must-have, it is one of the few classic fabric (weave) that has managed to easily evolve with times and styles. One instance it is simple and casual, next, it is all statement making and chic. Since its inception, denim has practically been moulded in every possible silhouette and structure. Besides the classic jeans, the one interpretation I am particularly fond of is, the denim shirt. For most of us, a denim shirt is a wardrobe staple. It is one of those seasonless pieces that can be worn year round. Being inherently casual, it can be quite tricky trying to come up with different ways to wear a denim shirt. To help you make the most of your denim shirt, here are three different outfits that illustrate how to style your denim shirt. Layer With It: When layering with a denim shirt, keep in mind, the denim shirt functions as add on, as an enhancing piece rather than a main piece of the ensemble. Since denim is neutral in nature, you can add a denim shirt to either tone down a look or spice up a rather somber one. Pair It With A Skirt or Pants: Denim shirt is a great alternative to the regular shirt. For a polished look, pair it with a skirt or pair of pants. To make the most of this look, opt for statement prints, shiny sequins or bold colours bottoms to pair with the denim shirt. No matter how loud or dramatic the pant/skirt is, the neutral characteristic of the denim shirt will balance the look out. Double Denim: You really can't go wrong with this refined denim-on-denim formula. The styling potentials are endless. Glam up and go all out with statement, colourful accessories or opt for polished metallic or monochrome pieces. Either way, both looks work just as well. A complete denim ensemble allows you to experiment to your heart's contentment. I recently discovered the joy of layering and a denim shirt was an ideal piece to start experimenting with. A denim shirt layered as a jacket is no new invention. However, with what you pair the shirt is the real game changer. In my initial experimenting stages I kept it simple and wore the denim shirt with a top and jeans. However, I decided to up my personal styling game for Lakmé Fashion Week and go for an Indo-Western, boho inspired look. Pairing my fave GAS Jeans denim shirt (it’s a men’s shirt) with a trench style kurta, crushed printed cotton skirt, tribal stone necklace and arty print tote. Along with being a new look it was also very flattering to my body type. The layering added colour and structure break that was very form flattering and stylish at the same time. 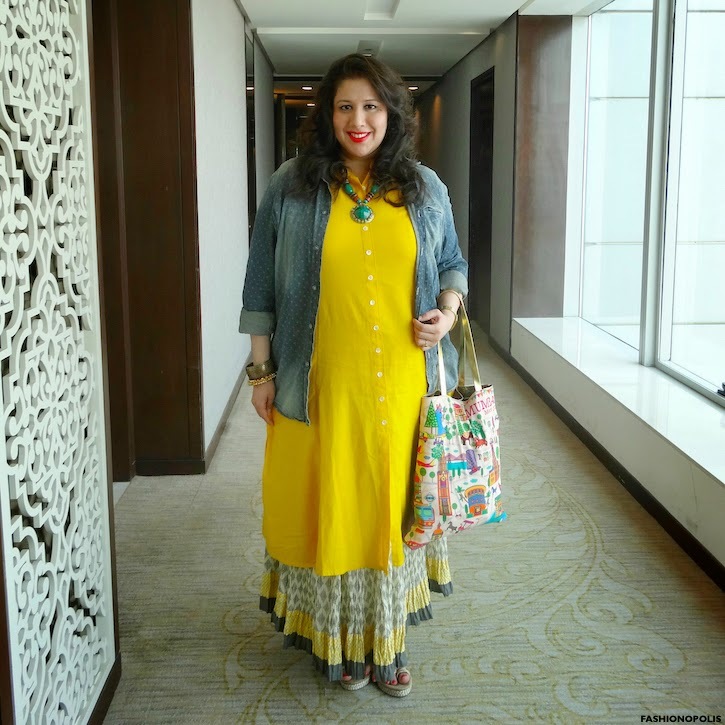 Being plus size I have shied away from wearing a denim shirt for a long time. The myth that denim shirt adds bulk was my biggest deterrent. However, while I still haven't found the confidence to wear it as a shirt or try a double denim look, layering with it has opened up new personal styling avenues for me. A picture speaks a thousands words and that picture clearly could help any with the denim shirt. Great post. I have been following a lot of fashion bloggers from India and you know, I think some should even blog some fashion stuff about guys as well. I mean we guys also wanna be fashionable haha and a blog post could help. Looking forward to read some amazing more amazing posts from you in the future.